If you want to let your hair down what better way than to stick on a funky bright coloured jump suit and platform shoes with star-shaped sunglasses and perhaps even an afro as you pay to enter a 1970’s themed disco and dance the night away! The dance floor takes place across 5x3 reels under a glitter ball with five other dancers surrounding you as you bust some moves to the energetic 70’s music that blasts out from the DJ booth. With 20 fixed paylines included, the Disco Spins slot machine boasts a 96.40% return to player percentage which will see you last into the small hours. You’ll gain entry to the disco from as little as 20p up to £200 if you want a VIP seat, and with up to 230,000 coins on offer for the hottest moves you better make sure your dance routine is on point! With the strobe lights glaring, the dance floor rapidly altering colour and the upbeat 70’s music blasting out, you’ll be bursting with excitement to get your groove on and be part of the action. The Wild symbols in the Disco Spins slot machine are different than the norm, with the potential for five different Wilds represented by the five Disco Dancers in what is called the Dance Floor Wild feature which will be discussed in more detail below. One symbol you can’t fail to miss is the glitter ball which acts as the Scatter symbol and is sure to brighten up the dullest of days. You’ll hit the dance floor to show off your moves with five other party goers, three of whom are female and two are male, but they all have one thing in common – funky 70’s outfits and even funkier hairstyles with the highest valued dancer boasting an afro. On the dance floor you will also see Ace to Jack icons which have the lowest values, however Net Entertainment could have used their imagination and included things like strobe lights or speakers in their place. As you spin the reels you will notice that the floor tiles on the dance floor constantly change, and should you match the floor tile colour to the associated dancer (for example the yellow dancer lands on a yellow floor tile) you are in for a wild time with big wins to enjoy. If this happens the symbol will be transformed into a Wild symbol unless it is a Scatter. You rarely go two spins back to back without reaping the rewards of the Dance Floor Wild feature, and if you manage to match a few dancers with their floor tiles on the same spin you’ll definitely be getting into the party spirit! Whenever a glitter ball (Scatter) shines brightly on the third, fourth and fifth reels during the same spin you will trigger a free spins bonus game, however what sets Disco Spins apart from most other online slot machines is that you get to choose between two free spins modes – either Regular free spins or Disco free spins, each of which has its own perks. Regular free spins: This sees you take to the dancefloor armed with 15 free spins with all wins achieved during them being subject to a very generous 3x multiplier bonus. In addition to this, every time you land two Scatter symbols you will have an additional 3 free spins added onto your counter. 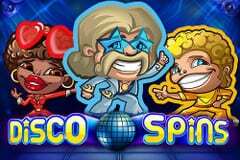 Disco free spins: This mode sees you receive 10 free spins without a multiplier bonus, and while that may disappoint you when compared to the Regular free spins mode, there is a good reason why. Only the Disco Dancers and the Scatter symbol will appear on the reels with all of the lower valued symbols removed from the reels which usually results in winning combinations every spin. Essentially the choice will come down to preference and how you like to play slot machines online as you choose more free spins with all wins tripled or else less free spins with no multiplier but a greater chance of big wins every time due to only high valued symbols featuring on the reels, however either way you will find yourself breaking into a little celebratory dance as neither free spins mode ever disappoints! Disco Spins is the perfect slot to help you unwind and get into the party spirit to dance the night away. The Dance Floor Wilds feature means you’ll be enjoying wild times with big rewards and in addition to deciding what drink you want you’ll get the choice of two free spins modes to spin the night away!